We have gift vouchers available for purchase. You can chose any treatment or combine different ones. 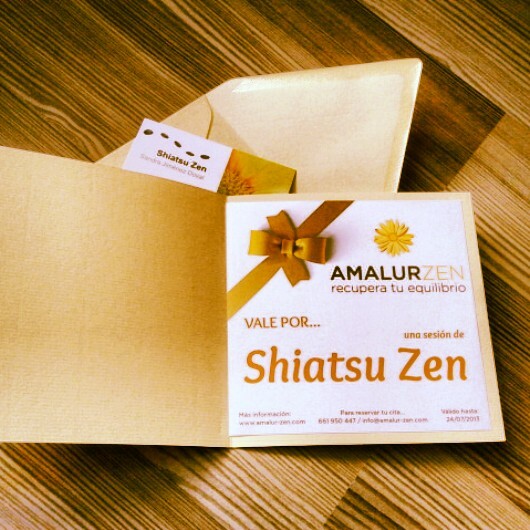 Contact us at info@amalur-zen.com for more information. Arrival: Please arrive on time for your appointment. Delays upon arrival reduces the time we have available for you. Please bear in mind that we have no recepcionist: if you knock on the door and no one opens, probably we are still in sessions with other customers. Please wait a few minutes, we will open as soon as possible.. Cancellation policy: Except in case of an emergency, appointments canceled with less than 24 hours in advance will be paid in full, and are no-refundable.